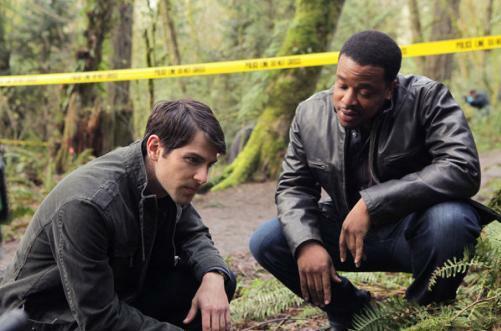 One could dismiss Grimm as just another police procedural with a sheen of fantasy painted over it. Fans of the show, which is on a lot of “best of” lists as 2011 draws to a close, will insist it is anything but. By all accounts it is a highly original show that puts a bona fide twist on the mystery-of-the-week formula. I, for one, have only seen the pilot. And based on this first episode, Grimm appears to be just another cop drama. It’s very possible that was the intention, seeing as NBC is the network that gave us the Law & Order franchise and has failed miserably in recent years with sci-fi and fantasy. So maybe creators Jim Kouf and David Greenwalt needed to present a first episode that felt tried-and-true. Their gambit worked. The show has now been picked up for a full season. The episode opens, as so many of these things do, with a character who we will only know for a few minutes before she is gruesomely murdered. We watch a young woman jog along a wooded trail, before a truly jump-out-of-your-seat moment. Next, as per the formula, we meet the detectives called in to inspect the crime scene. Nick Burkhardt (David Giuntoli, Privileged) and his partner, Hank (Russell Hornsby) check out the victims iPod, still blaring “Sweet Dreams are Made of This,” and what appears to be her arm. It looks like an animal attack except for the boot prints in the vicinity. At this point I found myself becoming distracted by product placements, namely iPod, iPhone and Nike, as well as the importance placed on the song playing on the iPod. (This latter detail does turn out to be surprisingly important.) Nick, meanwhile is distracted by something else. He starts noticing that when he looks at certain individuals they morph momentarily into monster versions of themselves. Nick is visited by an aunt who is dying of cancer, and she provides us with the premise for the show. She, like Nick, is a Grimm. That’s not a family name, but a title of sorts. We are not told exactly what that means, and neither is Nick. The implication is that they are put on this Earth to battle bad guys; it’s hard not to compare these Grimms to the brothers in 2005’s The Brothers Grimm. Nick, his aunt Marie, and his girlfriend, Juliette, are not particularly memorable characters. As the story is plodding along, at last we meet Monroe. Nick sees Monroe (Silas Weir Mitchell, My Name is Earl), thanks to his Grimm-vision, as a snarling beast. Naturally, Nick suspects him in the recent crimes. The best scene of the pilot is one where he and Nick meet; Monroe is busily marking his territory when Nick arrives. Monroe is a wolf-man or, as we learn, a blutbad (a German word meaning “bloodbath”). After attacking Nick in his yard, Monroe invites him in for a beer. In a fun role-reversal, Monroe marvels at the experience of meeting a real life Grimm. “I’ve heard about you guys all my life. My parents used to tell me stories about you guys; scared the hell out of me.” Like Angel of the Whedonverse, Monroe is a reformed monster. He stays on the straight and narrow through “a strict regimen of diet, drugs and Pilates.” The relationship that develops between wolf and cop promises to be the glue that holds this show together. If you can get through a rather dull first half to meet Monroe, Grimm looks like it might be a fun ride. Even if it begins with a procedural approach it could grow into something more (think Fringe). All 7 existing episodes are available on Hulu, if you want to catch up before new episodes resume on January 6. This entry was posted in 2010s, Dramas and tagged blutbad, David Giuntoli, fairy tale, grimm, little red riding hood, monster, police drama, procedural, Silas Weir Mitchell, wolf by meekthegeek. Bookmark the permalink.